I have never done this. Traveled with truck and trailer. I have picked up rides to avoid a bridge crossing, a dangerous intersection or treacherous traffic situation. But actually traveling with the horses in a truck and trailer like normal people do, no, I have never done this. It takes the edge off. The risk, the uncertainty is minimized and I can carry so darn much stuff!! Rosie came unexpectedly walking up to my front porch this summer and introduced herself as a “short lady long rider.” “I’ve been following your rides for years,” Rosie said. “I happened to be in the area and thought I’d look you up, I hope I’m not intruding.” We became friends immediately. 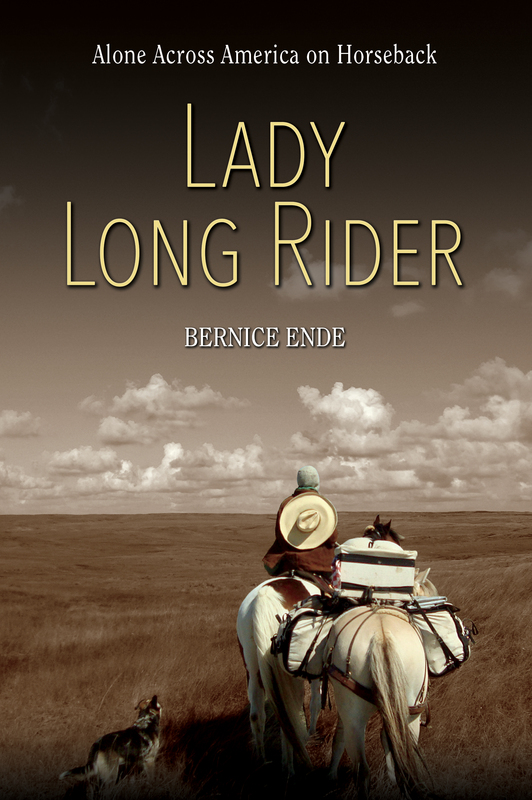 Rosie began doing short rides (100 to 300 miles) with her horses in 1964. She’s probably accumulated more miles than yours truly. I asked her if she’d like to go south this winter and ride. “I’ll provide the horses, you the truck and trailer.” (She retired her last horse in June of 2017) She’s a very good rider, light for Liska Pearl, they are a perfect match. So here we are, traveling with truck and trailer. I sleep in my tent, Rosie has comfortable horse-trailer accommodations. Spirit and Liska have never had it so good. My old 69 Ford miraculously pulled Liska and Spirit in my two horse-trailer 700 miles to Montpelier, Idaho. (south of Idaho Falls) Bitter winter winds and cold weather chased us south. It snowed 12 inches at my cabin two days after I left. November 1st Arrived in Montpelier, stayed at the fairgrounds, had covered stalls, good thing as it snowed and rained while I waited for Rosie who arrived on the 4th. I met Elaine Zeyer in 2009 when I rode through Montpelier on my 6000 mile ride – we’ve been friends ever since. She once again did what she did in 2009, she fed me. Wonderfully home-cooked food poured from her kitchen and then she sent a load of this years dried fruits and veggies with me. Good to see her again. She has my truck and trailer at her place. This time Elaine shared many of her friends and family with me while I waited for Rosie traveling with her golden lab/ridge-back dog Bella from Nebraska to rendezvous with me in Montpelier, Idaho. Each night the Milky-way clearly stretches across the sky from horizon to horizon. I love this country, but then I say that often. I say that even though this spacious desert country is daunting, merciless and presented me with some of the most difficult riding I’ve ever ridden. The red rock plateau’s, mesa’s and striking rock formations make one ooh and aah. The highway stretches out into eternity and I wonder, how in Gods name did I ever ride this country as I did from 2005 to 2009? There is so little water. Grass? What grass? And I rode single horse rides! Claire Dog walked, I walked, Honor, Pride and Essie walked 100’s of miles in this vast, dry, cracked desert country. Oh but I do love this country. I love the nights without bugs, without wind camped in sagebrush scented air, so still and clean it sinks deep into the lungs and I toss back my head and visually pull the stars to my chest wrapping my arms tightly around them. Lights rest on the horizon like stars that have fallen from the sky. The muffled sounds of car and truck traffic mingles with coyotes song. For the past nine years I have traveled northern routes bountiful with water, grass and campsites. Easy riding in comparison to these early routes and years. Those first few rides were lean, hard rides. If I had five dollars in my pocket I considered myself rich. I am reflective, even somber as I look out across land and roads that quite honestly look impossible to me now. “How ever did I do it?” I wonder, gazing out the window as Rosie, Bella and I drive smoothly and swiftly in the comfort of her new red Chevrolet pickup. “Why did I have to do it?” I ask myself. No answer. To many memories running through my head just now. Coming back through this country has sparked unexpected emotions that toss and turn in my head. But tonight camped on a route I rode in 2008, a mile off Interstate 25 south of Belen, NM.,I tell you it is paradise to me. North of me is an oasis, the Kiva RV and Horse Motel owned by Diane and Bob Wiltshire. In 2008 Diane and Bob invited me, Claire Dog, Essie Pearl and Honor in for the night. I remember being so deeply grateful as the horses were put in corrals, fed and watered and I slept, really slept for the first time in many nights. It’s one of the prettiest, well kept Horse Motels I have seen. But now Rosie, (who has known Diane and Bob for 4 years,) Bella, the horses and I are camped on BLM land just south of Bob and Diane’s business, Rosie and Bella in her trailer me in my tent. The horses in a portable fence. We have water and hay that I bought at a “Hay Vendor” in Gallop, NM a few days ago. The horses have apples and salt and Source Micro-nutrients and a little alfalfa and a little oats and they are like two pets that are spoiled and I love them for their curious want-to-be near me attitude, always nickering, always needing something. Rosie is calling this her “Canyon Ride” as she would like to see several canyons that she’s not ridden. So far we have taken 4 short rides. One in Nevada just out on BLM land where we’d camped for the night, one around McPhee Reservoir in Delores, NM, one at Boggy Draw (near Delores) and one along Delores Canyon. 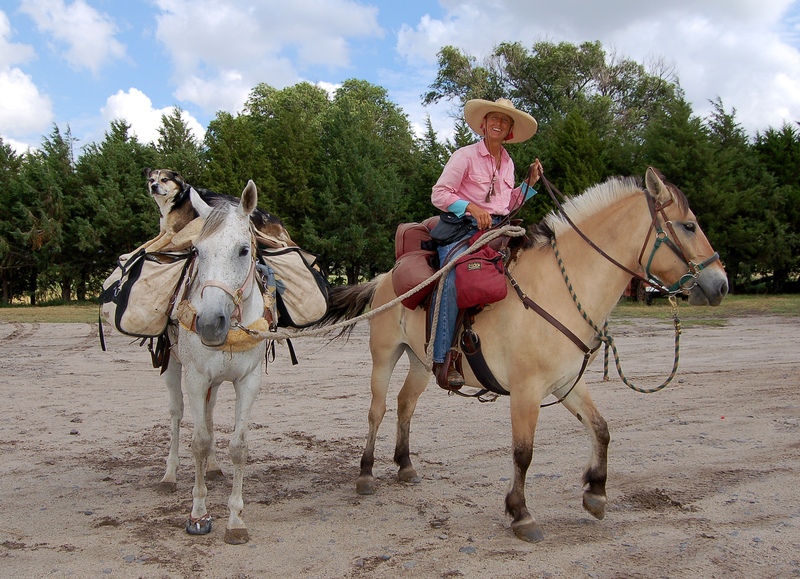 Next week we ride San Lorenso Canyon with Diane and her friends. My sister MaryAnn is coming from Edgewood, NM for a visit tomorrow. We will continue south with Bella in the lead, Rosie ahead of me on Liska Pearl who is gaining experience and strength. Bringing up the rear are two seasoned travelers who know one another very well, Montana Spirit and yours truly.